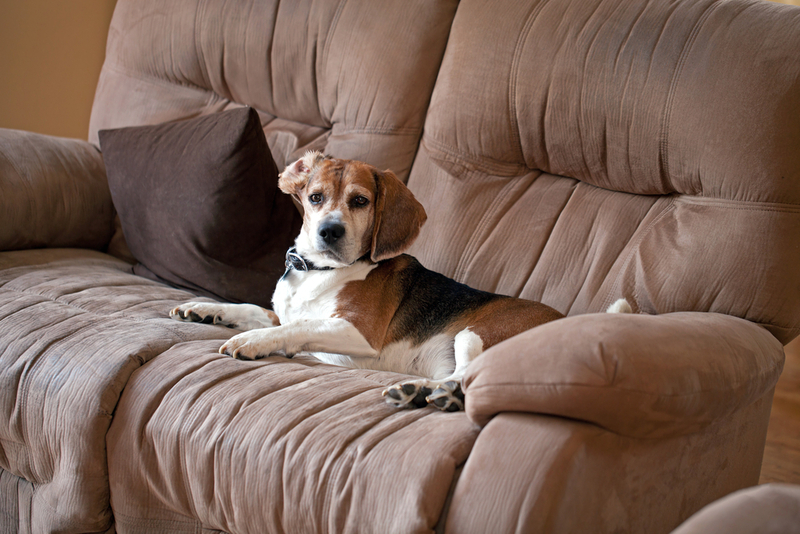 They are one of the most common types of upholstery material used to cover our couches. Microfiber lounges have become increasingly popular for their affordability and wide availability and they are available in a range of colours but commonly often in chocolate, raisin or cream. The downside of the microfiber surface is that it can attract a lot of dirt, dust, and crumbs deposits. People also complain the material can feel too hot or create static when sat on. On the plus side is that the polyester in microfiber couches can repel liquids much more successfully than other fabrics, preventing deep absorption of liquids. However cleaning these with a traditional steam cleaning machine from the supermarket may not be effective and may even leave unattractive water marks on your lounge. But there is a quick and easy solution to clean microfiber furniture, and the upholstery repair experts at Lounge Repair Guys explain the steps to brighten and liven up dull, dirty and tarnished microfiber fabric in this post. First vacuum couches with a brush attachment to remove hair, dirt and other debris from outside or from your floors. Using a rubbing alcohol solution and a spray bottle, spray lightly on affected areas without saturating the microfiber surface. Do small areas at a time, otherwise the alcohol will evaporate too quickly with larger areas. Using a clean white or light coloured dry sponge, scrub heavily the surface of the microfiber. You should start to see the grime, and entrenched dirt coming off on the sponge! Once the area has dried completely, using a soft scrubbing brush (bristles should be no tougher than a toothbrush) work over the fabric to even out the surface and plump up the fabric. This helps combat the material becoming dry and stiff feeling when it has been the liquid treatment has dried. If the fabric of your microfiber lounge has seen better days from severe entrenched dirt or other irreversible wear, reupholstering the lounge with a new upholstery covering may be the best option and is far cheaper than having to go out and buy new lounges. With just a little work with the Mobile Upholstery Specialists we can come to your home, collect your lounge and make it look good as new again with a range of techniques depending on what your furniture requires. Contact us today on 1300 10 15 10 to discuss all your upholstery repair needs in Brisbane, the Sunshine Coast, Gold Coast and Northern New South Wales.